Andrew Gwynne MP joined workers at Denton Sorting Office to mark the first ever National Postal Workers Day. The day, 14th December, marks the hard work and dedication of hundreds of thousands of women and men who collect, sort and deliver letters, parcels and packets for everyone everywhere. 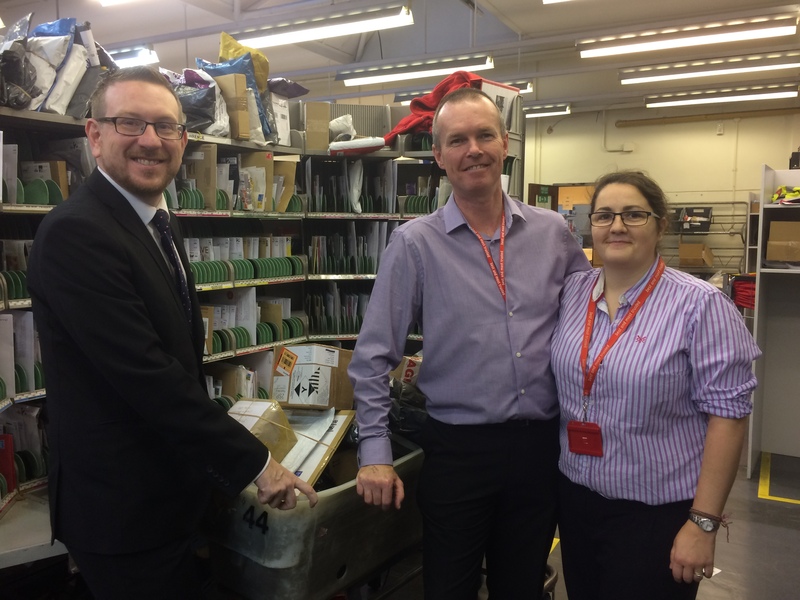 Gwynne visited Denton Sorting Office, which covers the M34 postcode – Audenshaw, Denton, Dane Bank and Haughton Green. He also met some of Parliament’s postal workers, including Trevor Barking, who has been delivering post to MPs for fifty years. Mr Barking started working in 1965, and remembers Winston Churchill lying in State in Westminster Hall shortly before his funeral. “Six days a week, the UK’s posties are out on their walks, on the road and in mail centres, each playing their part in ensuring that this vital public service delivers to everyone, everywhere. “National Postal Workers Day celebrates these people, reminds the nation of the value of the service they provide and the sheer hard work that that so many people put in to sustain it. “Six days a week, 52 weeks a year, in heat waves, rain and snow your local posties deliver letters, parcels and packets to every household and business in the country.